It’s time to start those Valentine cards! If you came here from Linda Cullen’s fabulous blog … welcome! You can get back to her via the button below. Here is my simple …yet … So Sweet Valentine. I needed some inspiration, so I turned to the Occasions Catalog (page 9!). I just LOVE the sentiments in the Hello Life stamp set … so sweet!!!! This card is made with one of our Whisper White Note Cards. 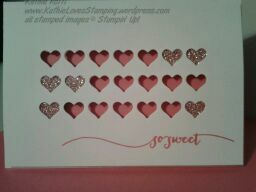 I used the heart strip from the Mini Treat Bag Thinlits Dies for the heart cutouts on a 4 7/8″ x 3 3/8″ Whisper White layer. (There are so many pieces to work with in that set of dies …. well worth the purchase!) I just lined up the die and cut three times to get the 3 rows. Then I stamped the sentiment in Strawberry Slush Classic Ink. Tip: Remember to use your Stampin’ Pierce Mat under your cardstock when stamping with the Photopolymer Stamps for a crisp and solid image. The glimmer hearts were created by inserting small strips of Silver Glimmer paper that I dyed with Strawberry Slush re-inker and a sponge dauber. (Your dauber will get glitter on it … DO NOT use your ink pad for this!!! … you don’t want a sparkle-y ink pad.) AND take-it-from-me: Allow the strips to dry well before assembling … Strawberry Slush finger prints somehow appeared on my first effort! 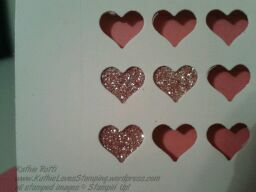 I attached the glimmer pieces directly to the back side of the heart layer with glue dots. 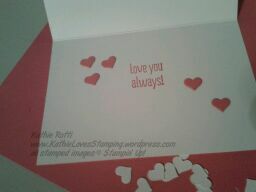 I then popped up the heart layer with double Stampin’ dimensionals on a piece of Strawberry Slush cardstock. I always like to add something to the inside of my cards. I cut some Strawberry Slush hearts with the die and glued them around the sentiment from Something to Say from the annual catalog. I hope you enjoyed your time here …. Thanks for stopping by … onto Mary Bush’s creation … which is going to be amazing! < Previous ‘Tis the Season for Gift Cards! LOVE this CUTE card!! This would be a great notecard for a thank you too! I’m on the band wagon for the Treat Bag die…can’t believe I haven’t gotten it before now! Love your card; and giggled in appreciation of the ‘thumb prints’! Great idea…got to play with the tiny treat bag framelits yesterday….and yes there are a lot of wonderful accessories with the basis bag pieces! Wonderful card!